In the previous article (http://ponnadi.blogspot.in/2012/10/archavathara-anubhavam-thiruppanazhwar.html) we observed thiruppANAzhwAr's archAvathAra anubhavam. Let us now see thirumangai AzhwAr's archAvathAra anubhavam. mAmunigaL glorifies thirumangai AzhwAr's greatness in upadhEsa rathina mAlai 8th and 9th pAsurams. Let us enjoy that to start with. In the 8th pAsuram, mAmunigaL says, this kArthigai thirunakshathram is far greater than any other thirnakshathrams because of the birth of thirumangai AzhwAr on this day. While explaining "vAyththa pugazh" (வாய்த்த புகழ்), piLLai lOkam jIyar explains that AzhwAr got thirumanthra upadhEsam from thirnaraiyUr nambi himself by force. Even emperumAn is scared of thirumangai AzhwAr. Such are his glories. He also goes on to say thirumanthram is also "vAyththa thirumaNthiram" (வாய்த்த திருமந்திரம்) - the greatness of thirumanthram is also established. After all, kaliyan appears to remove the ignorance of samsAris in this samsAram and he does that by explaining the meanings of thirumanthram in detail. http://ponnadi.blogspot.in/2012/10/archavathara-anubhavam-nammazhwar.html), thirumangai AzhwAr's prabhandhams (periya thirumozhi, thirukkurunthANdagam, thiruvezhukkURRirukkai, siriya thirumadal, periya thirumadal and thirunedunthANdagam) are considered as the essence of six angams of vEdhas namely sIkshA, vyAkaraNam, chandhas, niruktham, kalpam and jyOthisham. This is explained by azhagiya maNavALa perumAL nAyanAr in AchArya hrudhayam chUrNikai 43 and elaborated by mAmunigaL in his vyAkyAnam beautifully. Also, piLLai lOkam jIyar brings out two specific greatness for AzhwAr when explaining "vIRu". Since AzhwAr himself says to emperumAn in periya thirumozhi 4.9.6 "NummadiyArOdum okka enNnNiyiruththIr adiyEnai" (நும்மடியாரோடும் ஒக்க எண்ணியிருத்தீர் அடியேனை) - "dont consider me like other adiyArs". It is explained that AzhwAr is unlike pirAtti who could wait for 10 months or other AzhwArs who were able to sustain themselves by just thinking about emperumAn's other manifestations (param, vyUham, etc) and thirukkalyANa guNams. For AzhwAr, he will only sustain by seeing archAvathAra emperumAns and doing mangaLAsAsanam to them. Also, just like a father is attached more to his last child, emperumAn is attached more to him as he is the last AzhwAr. As he himself says in thirunedunthANdagam pAsuram 6, "thAnugaNtha UrellAm than thAL pAdi" (தானுகந்த ஊரெல்லாம் தன் தாள் பாடி), he went around to many archAvathAra dhivya dhEsam emperumAns physically and glorified them in his pAsurams. In the thirunedunthANdagam, periyavAchAn piLLai explains that "thAn ugaNtha" means - what is pleasing to emperumAn (because he is coming to samsAram to help samsAris), but neither nithya sUris are pleased with it (since emperumAn keeps trying without much result as not many samsAris come to him) nor samsAris are pleased with him (since they are attached for so many materialistic aspirations). But as we see, AzhwAr is very attached to all the dhivyadhEsa emperumAns since he goes around glorifying them. thirumangai AzhwAr's attachment towards archAvathAra emperumAns is unlimited. periyavAchAn piLLai shows in thirunedunthAndagam avathArikai that once emperumAn gave him divine/blemishless knowledge, AzhwAr started enjoying the archAvathAra emperumAns who are the representation of the meanings of thirumanthram. emperumAn started thinking AzhwAr may decide to just stay in this samsAram enjoying dhivya dhEsams and showed the cruel nature of samsAram so AzhwAr sung "mARRamuLa" padhigam showing his fear in this samsAram. Seeing that he is still in samsAram AzhwAr started glorifying archAvathAra emperumAns and ones who are attached to them in thirukkurunthANdagam and thiruvezhukkURRirukkai. But since he did not still get mOksham, he decides to perform madals (siriya thirumadal and periya thirumadal) where he starts chastising archAvathAra emperumAns (who is full of saulabhyam but still not favouring AzhwAr). Finally in thirunedunthAndagam, he glorifies the archAvathAra emperumAns again and reaches paramapadham in the end. Let us see AzhwAr's unlimited attachment for archAvathAra emperumAns from a few of his pAsurams. 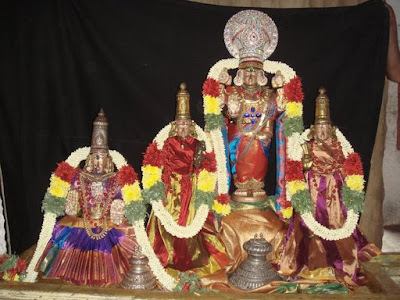 In periya thirumozhi, AzhwAr starts his prabhandham with glorifying thirumanthram. 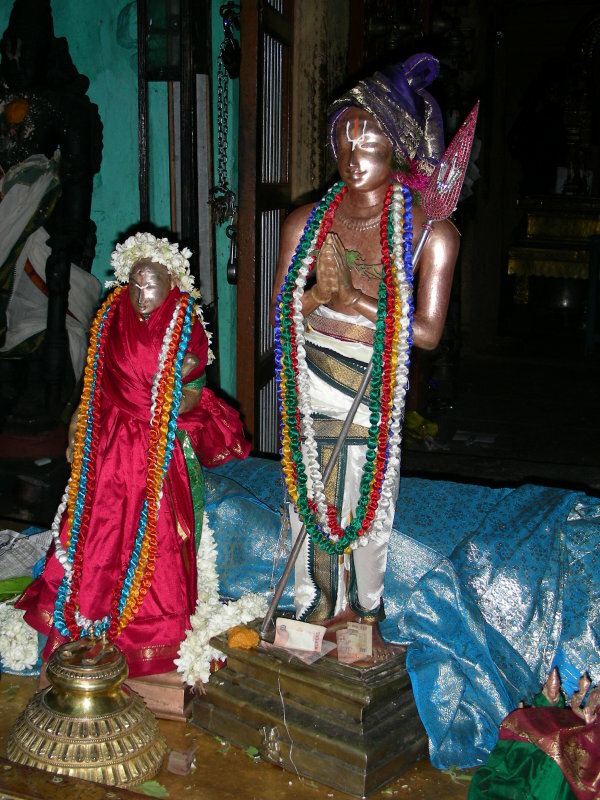 AzhwAr was given thirumanthra upadhEsam by thirunaraiyUr nambi emperumAn. All the dhivya dhEsams are explained as establishing the real meaning of thirumanthram - that we are fully subservient to emperumAn only and serving him is our ultimate goal. But the inner meaning of thirumanthram is that we are actually subservient to emperumAn's adiyArs. This is revealed by AzhwAr in thirukkaNNapuram padhigam. Let us see that from thirumozhi 8.10.3. Azhwar says to souri perumAL "I will not even mix with people who accept/worship other dhEvathAs. After learning thirumanthram, I learnt that I am a servant of your adiyArs". One of the important relationships between emperumAn and jIvAthmA is the barthru/bhAryAL sambandham (husband-wife). 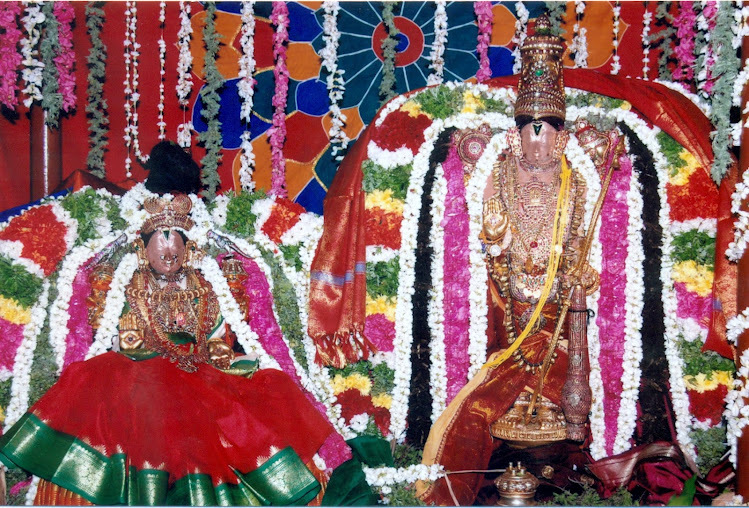 Thirumanthram is considered as the thirumAngalyam (mangaLa sUthram) which is tied by emperumAn to the jIvAthmA. When this relationship is established by an AchAryan, it is the duty of jIvAthmA to fully depend on emperumAn and it is the duty of emperumAn to fully protect the jIvAthmA. Just like the husband will be more pleased when his wife is affectionate to and takes care of his relatives (father, mother, etc) and vice versa, emperumAn will also be more pleased when the jIvAthmA is affectionate to and takes care off his eternal relatives (adiyArs). AzhwAr himself showed examples in his pAsurams. Let us see a couple here. In thirumozhi 2.5 - "pArAyathu uNdu umizhntha" padhigam, he glorified thirukkadal mallai emperumAn and he immediately followed it up in 2.6 "naNNAtha vAL avuNar" padhigam, where he fully glorified the adiyArs of thirukkadal mallai emperumAn. In thirumozhi 7.4 - "kaN sOra" padhigam, he glorifies emperumAn in the first part and glorifies sAranAthan's adiyArs immediately in the later part of each pAsuram. One speciality of AzhwAr is that he sees everything (parathvam, saulabhyam, etc) in archAvathAra emperumAn. Let us enjoy the essence of one padhigam in thirumozhi (7-3 - sinavil) where AzhwAr sees everything in thirunaraiyUr nambi who happens to be his direct AchAryan as well (the one who performed thirumanthra upadhEsam to AzhwAr). As it is said in srivachana bhUshaNam by piLLai lOkAchAryar in sUthram 450, all five manifestations namely param, vyUham, antharyAmi, vibhavam and archai are all literally enjoyed by AzwAr in his own AchAryan. In the first pAsuram, AzhwAr enjoys rAma charithram and declares that he was able to visualize emperumAn (who is unseen) as thirunaraiyUr nambi in his heart. By starting with perumAL who killed the rAkshasas and protected the rishis/dhEvas, AzhwAr is focussing on the rakshakathvam of emperumAn. In the second pAsuram, AzhwAr is describing emperumAn as amararkku ari ERu (அமரர்க்கு அரி ஏறு) - leader of nithyasUris. AzhwAr is praising empeumAn's rakshakathvam again in protecting everyone during praLayam and his beauty by describing emperumAn's beautiful ears. AzhwAr is seeing thirukkOvalUr Ayan in thirunaraiyUr nambi in this pAsuram and he is saying he is fully depending on thirunariyUr nambi. In the third pAsuram, AzhwAr is enjoying emperumAn's antharyAmithvam. AzhwAr sees thirukkudanthai ArAvamuthan in thirunaraiyUr nambi and is saying he will be unable to forget emperumAn due to the many favours that were done by him. In the fourth pAsuram, AzhwAr is enjoying kaNNan emperumAn's charithram (and rAma charithram again) and glorifying his saulabhyam. That saulabhyam's ultimate nature is enjoyed in none other than thiruvaranganAthan who is seen in thirunaraiyUr nambi. AzhwAr declares his heart will not bow down for anyone else other than emperumAn. In the fifth pAsuram, AzhwAr's heart goes behind kaNNan emperumAn's navanItha chaurya charithram. Also, thiruvEnkatam is glorified here and thiruvEnkatamudaiyAn is seen in thirunaraiyUr nambi. In the sixth pAsuram, emperumAn is enjoyed as kshIrAbdhi nAthan by AzhwAr. ThirumAlirunchOlai azhagar's extreme beauty and sweet nature is seen in thirunaraiyUr nambi and AzhwAr is saying he will glorify no one else. In the seventh pAsuram, AzhwAr is recollecting the parathvam of emperumAn and how mercifully emperumAn entered his heart. AzhwAr is saying his mouth will not not speak about anyone other than thirunaraiyUr nambi. In the eighth pAsuram, AzhwAr is cherishing emperumAn's upAyathvam. He is showing his gratitude to thirunaraiyUr nambi for protecting him in this samsAram itself. In the ninth pAsuram, AzhwAr is glorifying rAma charithram. AzhwAr sees thanjai mA manik kOil narasimhan emperumAn in thirunaraiyUr nambi and declares that he will not perform mangaLAsAsanam to any one other than emperumAn. In the last pAsuram, AzhwAr is saying that for the ones who learn these 10 pAsurams (which are like nectar for emperumAn's adiyArs who worship him, chant and dance glorifying him), no sins will affect them. 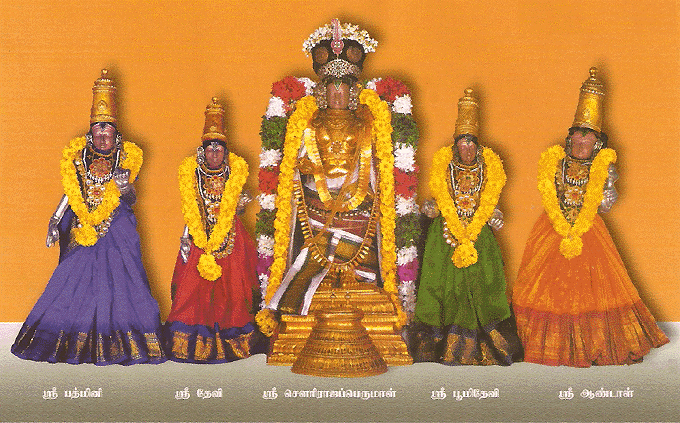 thirunedunthANdagam is one of the most glorious prabhandhams of AzhwAr. It is called as thirunedunthANdaga dhivya sAsthram and bhattar uses the valuable points from this prabhandham to defeat vEdhAnthi (who eventually becomes nanjIyar) in a debate. periyavAchAn piLLai has done a detailed vyAkyAnam for this prabhandham and it is one of the most relishable works in our sampradhAyam. In this, in 13th pAsuram, as stated in motherly bhAvam (AzhwAr taking the form of the mother of parakAla nAyaki and talking about her) AzhwAr enjoys vibhavAvathArams and archAvathArams together. Let us see the unique nature of AzhwAr which is explained by periyavAchAn piLLai in the vyAkyAnam. lifted gOvardhana giri and protected the gOpas and gOpis. lives in the most lovable dhivyadhEsam thiruvUragam which is in the kAnchipuram area. broke the bow and married sIthA pirAtti. is the king who lies down in thiruveHkA. fought with the wrestlers and defeated them as kaNNan emperumAn. killed kEsi who took the form of a horse. But, when the parrot starts reciting the names of emperumAn her sorrow becomes multi-fold since she is reminded about emperumAn more than ever before by hearing the names and so she starts crying more. periyavAchAn piLLai gives a wonderful vyAkyAnam. It shows our AchAryas were born to write sath vishayams (and ofcourse we are born to read and enjoy them). Let us enjoy some of the important aspects from the vyAkyAnam. bhOgyam (enjoyable) - achyuthA amararERE (glorifying him as the lord of nithyasUris). pAvanam (purifying) - Nin NAmam kaRRa Avalippu (saying his names purified AzhwAr). dhArakam (makes one sustain themselves) - gOvindhan guNam pAdi - Avi kAththiruppEnE (sustain myself by singing emperumAn's qualities and names). nanju (poison) - kaNNan nAmamE kuzharik konRIr (killed me by saying kaNNan emperumAn's names). For kaNNan emperumAn, gOpas and gOpis going to dhEvathAntharam (indhran) is like giving his wife to some one else. It was completely unbearable for him, that is why he diverted them from worshipping indhran. One of the most unique qualities of AzhwAr is beautifully explained here. Just like a prince will have a spoon of ghee for every spoon of food he eats, AzhwAr will have archAvathAram anubhavam in every line. It is also shown that, while other AzhwArs will see parathvam (supremacy) in paramapadhanAthan, nIrmai (simplicity) in vibhavAvathArams and to see that simpliciyt they look at archAvathAram, AzhwAr always sees everything in archAvathAram only. rAma charithram is beautifully explained here. After breaking the bow when asked about the marriage, perumAL said he broke the bow because his AchAryan (viswAmithran) said so, but for marriage, they have to talk to his father and vasishtar. Being amazed at this quality of emperumAn, pirAtti melted like water and seeing that, since perumAL was tired he immersed himself into pirAtti who melted like water. 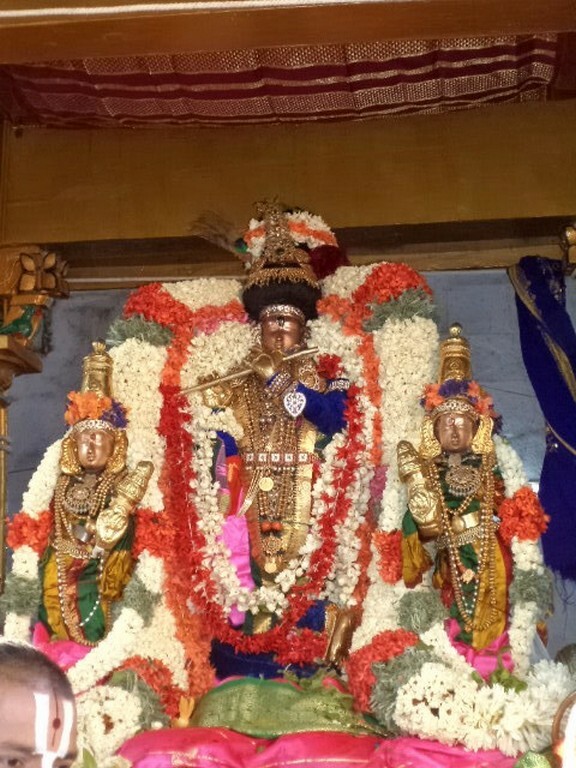 It is also shown that even for perumAL and pirAtti (who are always together) when they are separated they need some one (AchArya sthAnam) to connect them. An important svApadhEsam is explained here. Breasts are to be treated as bhakthi which is what the jIvAthmA has and what emperumAn likes - when there is mention about breasts, it should always be interpreted as bhakthi. This is similar to eyes (jnAnam) which should be broad, hip (vairAgyam) which should be very thin, i.e., we should have very little attachment towards material aspirations, etc. Other AzhwArs are like malayaLars (people from kEraLa) who can eat well for a month but starve for another month if necessary. They can sustain themselves during samslEsham (union) and vislEsham (separation) with perumAL. But AzhwAr is so tender hearted that even during samslEsham he is so worried about separation. 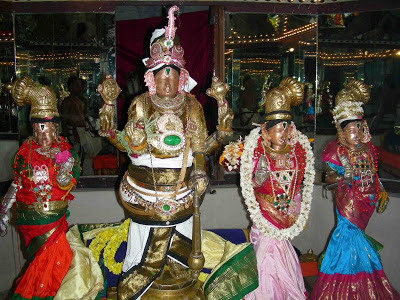 In siriya thirumadal, AzhwAr performs madal to attract kaNNan emperumAn. In periya thirumadal, AzhwAr performs madal to attract thirunaraiyUr nambi. Both prabhandhams are done in parakAla nAyaki bhAvam (as a girl). madalUrthal means, when one person falls in love with another, and the other person is not showing any interest, the person in love carries a painting (of the other person) and a palm leaf in public and declares that he/she is in love for the other person. Out of shame or understanding the true love, the other person will accept the person in love. AzhwAr is unable to bear the separation from emperumAn and wants to achieve emperumAn some how. This is similar to nammAzhwAr also who did the same act out of desperation. So, in this case, their ignorance (that we should make some effort to achieve emperumAn) is an outcome of their extreme love for emperumAn and this is priceless (unlike the ignorance of ordinary humans) and to be celebrated. It is also shown that emperumAn is glorified for his wonderful guNams (qualities). And it is his true nature (svarUpam) to be full of great qualities. By performing madal, people will disregard his good qualities and he cannot accept that. So, AzhwArs think that by performing madal, he will come to them immediately since he cannot bear the thought of others accusing him of lacking good qualities. AzhwAr beautifully explains the qualities of several dhivya dhEsa emperumAns only to say in the end that those qualities are not really helping him. Finally, let us see AzhwAr's attachment to thirukkudanthai ArAvamuthan. AzhwAr, in periya thirumozhi - vAdinEn padhigam (1.1), while explaining the glories of thirumanthram, right in the second pAsuram itself. He says "chUzh punal kudaNthaiyE thozhuthu uyya" (சூழ் புனல் குடந்தையே தொழுது உய்ய) in this pAsuram. In the end, in thirunedunthANdagam, 29th pAsuram, just before leaving to paramapadham, he is calling out to "thanN kudaNthaik kidaNtha mAlai" (தண் குடந்தைக் கிடந்த மாலை). By saying "mAl", AzhwAr is enjoying emperumAn's vAthsalyam (motherly forbearance) even just before leaving to paramapadham. AzhwAr also, dedicated a whole prabhandham, thiruvezhkkURRirukkai, for thirukkudanthai ArAvamuthan emperumAn. With this we have seen a little glimpse of how different AzhwArs enjoyed archAvathAra emperumAns. AzhwArs' attachment to archAvathAra emperumAns is unlimited and it is difficult to express them with our humanly words. Without the vyAkyAnams of our pUrvAchAryas we can hardly understand anything in aruLicheyal. Let us take a moment to show our gratitude to AzhwArs and AchAryas for their great contribution towards the benediction of us - they are certainly like oasis in this desert of samsAram. We will move on to seeing how different AchAryas enjoyed archAvathAra emperumAns. In the next article we will see thirukkachi nambi's archAvathAra anubhavam. Mudhal AzvargaL are immersed in parathvam. Nam Azvar in krshNAvathAram. KulasEkarAzvar in rAmAvatharam. Tirumangai Mannan is immersed in vugandharuLina nilangaL. Having visited and sung more than 80 divya dEsam-s, his affection towards divya-dhEsam-s is next to none. The 100 and 100 pasuram-s each to ThirunaRayUr and ThirukkaNNapuram reflects AchArya Bakthi. The vUDal and anukkAram at archAvathAram is unique. The natural surroundings attracting kaliyan manifests into wonderful hymns mixed with honey but full of thathvArtham-s. Broadly commencing from north, Tirumangai AzvAr travels to south. The songs of thriuvAli -kaLvan kol and thUviriya are breathtaking. The poetic outbursts of thirunAngur is great. The nAdhan kOil Songs are rythmic, while it is full of virakthi and thathvam in Sri Oppiliappan kOil. 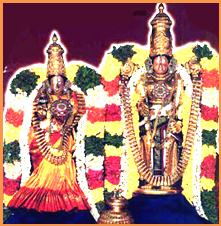 It is dhathEya shEshathvam in thiruchERai and Thirukkadal mallai. It is emotional blackmail in thiruppullANi - namakkEA nalam Adhalin. A great divine journey! A great divine experience. tells them one and all good bye in the first thirumozhi of the tenth ten. oru -nal suRRam- Dear Good relatives. sri periya vAchAn piLLai's commentary reflects this aspect. enRu ippadiyEa vugandharuLina dhEsamengum mugam kAttugiRAr"
are his dear and nears.